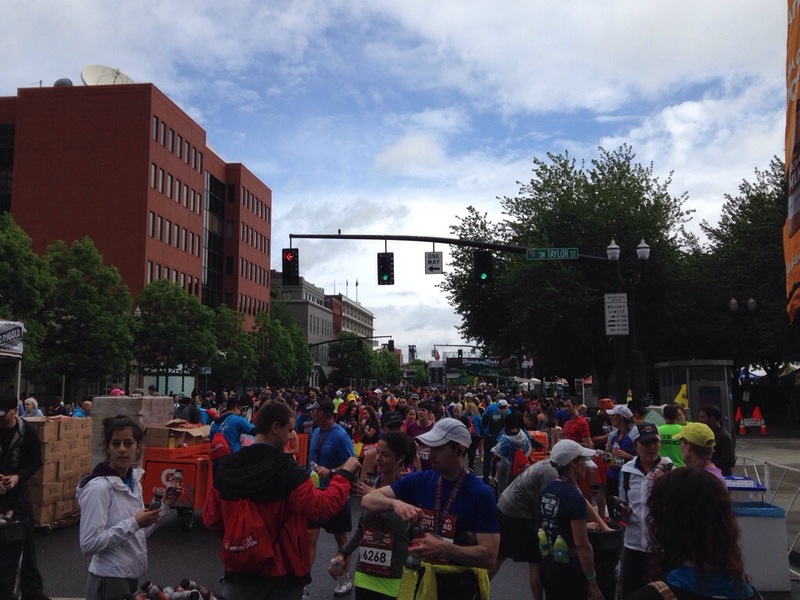 Today was the Portland Rock’n’Roll Half Marathon. 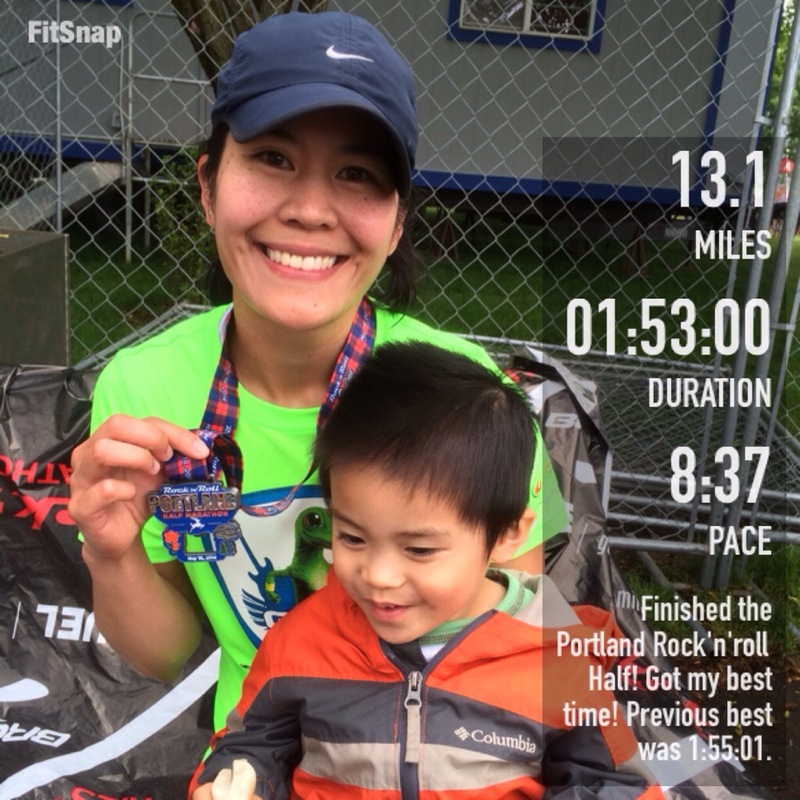 This was my third time doing Portland’s Rock’n’Roll Half. I like doing this race because it’s a fun one with an awesome and big crowd that cheers you along the way! There are so many people on the sidelines, cheer-leading squads, as well as bands that provide music as you run through the streets. It’s entertaining and helps motivate me at times. I like seeing the people on the sidelines cheering me on and reading the different signs. You can also see some crazy people like a guy with nothing but Speedos on and a guy wearing Depends, lol. This course starts at the Waterfront and you get to run on two bridges as well as end at the Waterfront. It’s a nice course that allows you to see a different side of Portland. Also, it’s a pretty well organized race. There’s lots of water and Gatorade along the route as well as a Gu station. My husband said there was like forty something corrals but I’m not sure. I was in corral 5. Below is a pic with my little guy by corral 5. We were there about a half hour early and there wasn’t very many people yet. It was also raining. 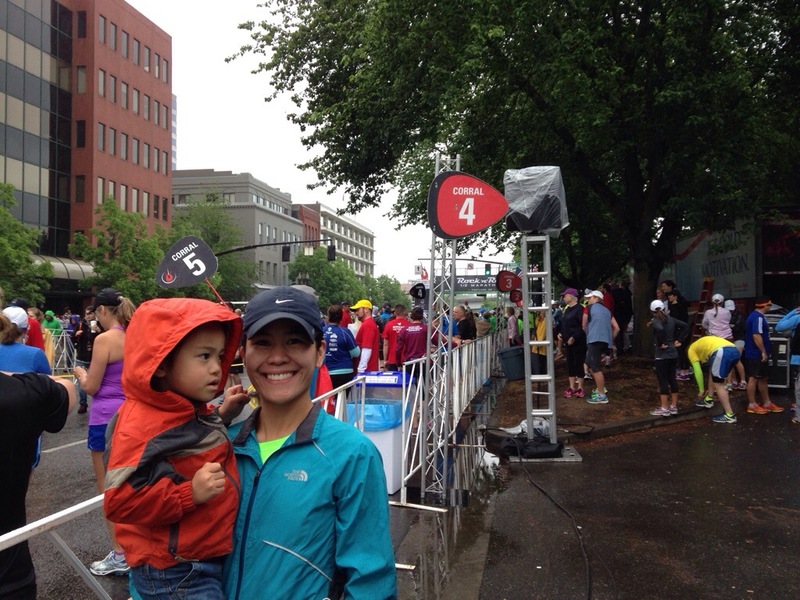 I’m glad it stopped raining, especially for the spectators like my little guys and husband, shortly after the race started. Here I am sporting the Geico shirt won at the Expo. It’s a nice Brooks shirt. My son actually won it for me since he pressed the button on the machine :). It also came with a bag, visor, and water bottle. 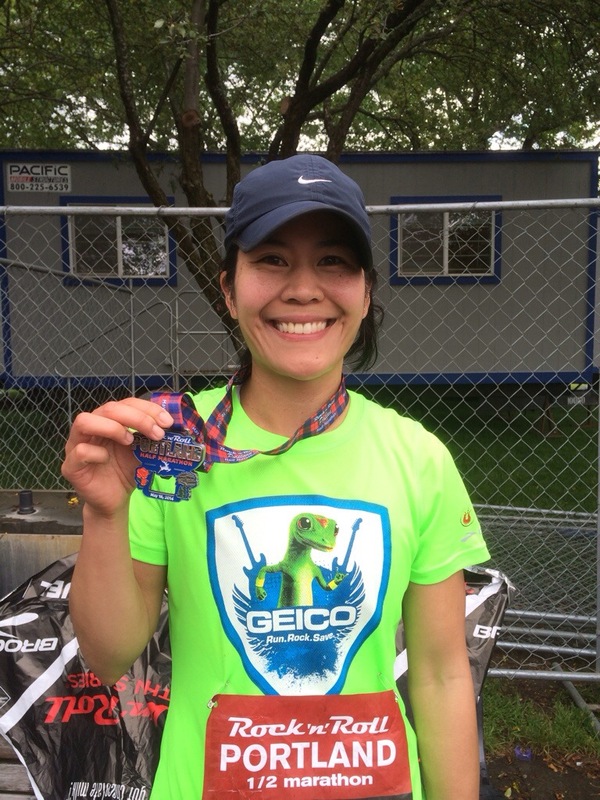 Plus, I was told that if you wear the shirt at the race you get a free massage at the end at the Geico booth. The race was supposed to start at 8 am but it started a little later due to Amtrak. Like I mentioned above, it was raining at the start, but it wasn’t that bad. It was mostly light rain. Once the race started, I felt good. I ran my first mile in 8:04 according to my Garmin, which is pretty fast for me. The second mile was pretty fast too at 8:12. Then the third mile split was 8:09. I was going too fast, I think. I need to work on my pacing. The fourth mile split was 8:19. I got a little side ache but just worked on my breathing and it eventually went away. The fifth mile split was 8:20. I won’t list all my splits but below is a screenshot my husband took of the live tracking on his phone. I have a Garmin Forerunner 220 and it has a cool feature that allows him to track me. 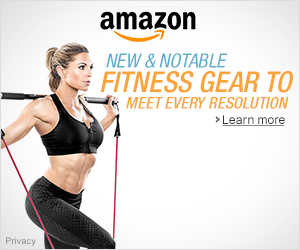 My husband says that it automatically refreshes after 15 sec or so. Not bad. It’s cool because he gets to see where I am, as well as my average pace and distance. But I think it was a little after mile 10, my calves felt like they would ball up. I was thinking oh no, please don’t ball up. So this happened throughout the rest of the race. I had to go easy and tried not to go too fast in fear of the balling up of my calves. I don’t know how I did it but I managed decent splits. But the fear was always there. I think I was on the Steel Bridge and walked a tiny bit to see if it would help but it was the same. I pushed through and still went easy on my legs. I think when there was about a half mile I thought screw it, I’ll take the chance and sped up. I’m so thankful my calves didn’t ball up on me! I ended running the last .16 miles at a 7:28 avg pace. I also got my best half marathon time despite not using my full effort due to my calves issue. So I’m still happy about the race! Below is a pic after the race where I got the free stuff like water, chocolate milk, pretzels, bagels, bananas, and power bars. Below is a pic with the finisher’s medal. It wasn’t the greatest day but at least it wasn’t raining for most of the race. My official time was 1:53:00. PR…woohoo!! Oh and the headlining band at the end that I didn’t stay for was G. Love & Special Sauce. I’m not familiar with this band but according to the Rock’n’Roll site, G. Love & Special Sauce is known for knee-jerking, harmonica laden performances interlaced with hip hop flavor and a heavy blues influence. He’s performed and recorded alongside Jack Johnson, and has a wealth of well known hits like Baby’s Got Sauce andSunshine in addition to songs from his most recent collection, “Fixin’ to Die.” His fifth solo album, “Sugar,” is set to release in April. Have you done a Rock’n’Roll race? What’d you think? Who was the headliner?